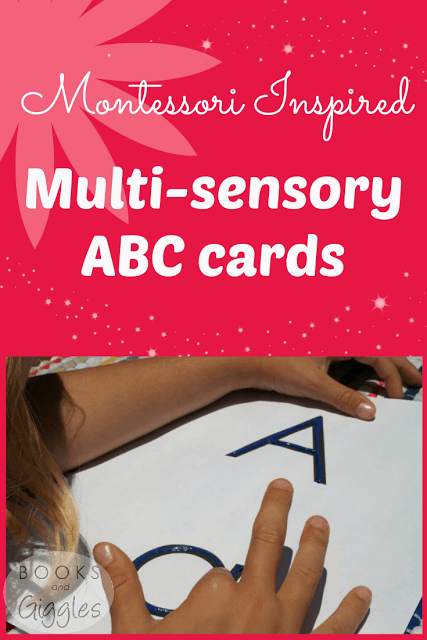 In Montessori programs, teachers introduce the ABCs with sandpaper letters. These are boards, maybe about 4″ x 6″, with the letters on them in a rough, sandpaper-y texture. 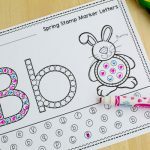 Children trace the letters with their fingers and say the corresponding sound. Most Montessori children do, that is. Not my son. He didn’t like the feel of the sandpaper, and refused to touch them. So we had to figure out a sandpaper letters alternative. His teacher and I worked out an alternative. At school, which was very purist in its approach to Montessori materials, he would skip that lesson. At home, I would work with him on learning letters in a different way. 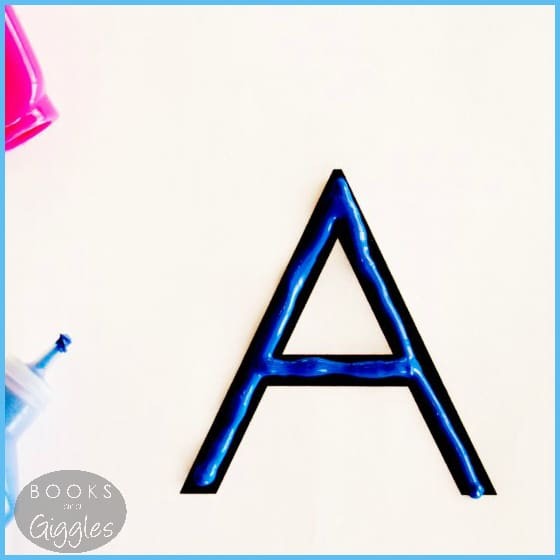 I printed out the alphabet, and wrote over each letter with Dimensional Fabric Paint (Amazon affiliate link). This technique made a letter he could trace a finger over and really feel, yet it was a smooth, pleasing surface. 1. Print out the letters on card stock. I used 275 pt Century Gothic font. You may prefer a more traditionally Montessori font, such as D’Nealian. 2. 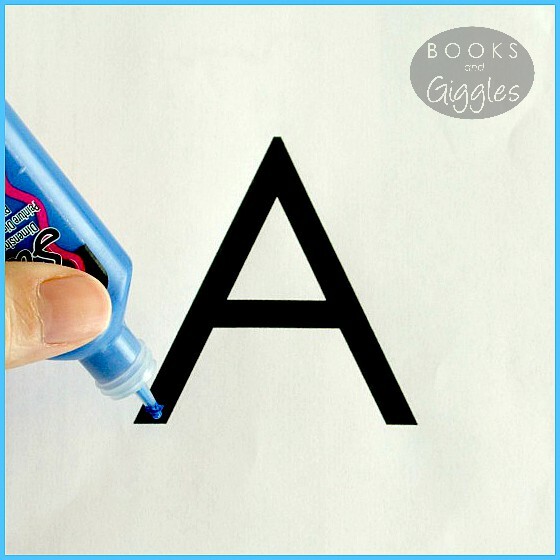 Squeeze fabric paint along the lines of each letter, being careful to leave a thick trail of paint. Don’t run the tip through the paint. 3. Let it dry flat and undisturbed overnight. Work with your child on just a letter or two at a time. 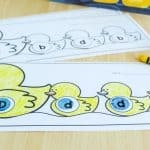 Show your little student how to trace the letter while saying its name and/or sound. 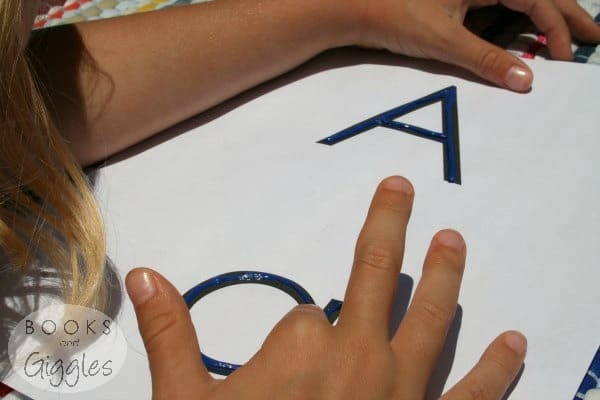 You can prepare the child for writing by having him or her trace with the index and middle fingers together. Those same two fingers will be guiding a pencil into letters before you know it. If you really want to bump up the learning, you could find objects or pictures that start with each letter, and pair them together. Have fun with it! Books and Giggles is a participant in the Amazon Services LLC Associates Program, an affiliate advertising program designed to provide a means for sites to earn advertising fees by advertising and linking to amazon.com. These are so great! 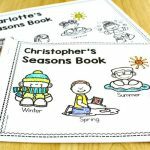 My sister-in-law did some like these a few years ago for her homeschooled kids and then gave them to me. They really lasted a long time and are still so useful. Found you #twinklytuesday. Thanks for sharing! I'm so surprised that a Montessori school, with the philosophy of child led learning, wouldn't be able to accommodate a texture aversion!! Great solution. Thanks for linking with #TwinklyTuesday! It was an AMI school. I think they are less open to interpretation than AMS – at least our school was. I moved my girls to an AMS school, and their approach to materials, among other things, was very different. I'm glad you found a better fit! Ah, what a good idea! 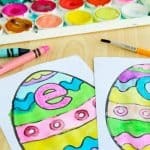 We did something like this with clear glue, but I like the colorful puffy paint much better!